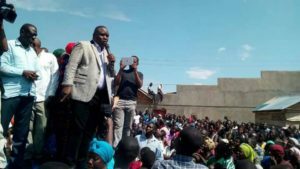 Lukwago campaigns for FDC’s Nantale during one of the rallies. Photo by Raymond Mayanja. 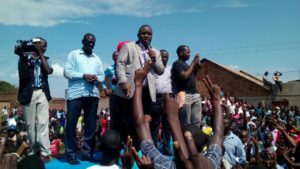 The Lord Mayor Erias Lukwago and opposition city councilors yesterday joined the battle to help Forum for Democratic Change (FDC) capture Iganga Woman district Parliamentary seat. Lukwago’s cordial relationship with Dr Kizza Besigye, former FDC presidential candidate, makes him to appeal to many FDC supporters. Lukwago is a member of Democratic Party (DP) though he contested for Lord Mayorship as an independent candidate due to misunderstandings within the DP party ranks. Lukwago told Iganga residents to advise President Museveni not to contest in 2021. He also asked voters to turn up in large numbers and vote for the FDC candidate Mariam Nantale in the by-election scheduled for tomorrow. Lukwago and Dr Besigye campaign for Nantale. “Museveni wanted to close my office but city dwellers refused. I am still in the city as the Lord Mayor. You should also reject his NRM candidate by voting Nantale,” he said. The Iganga Woman MP seat fell vacant after the death of Hailat Kaudha Magumba who succumbed to pregnancy-related complications in May this year. Others in the race are Brenda Asinde (NRM), Asha Babirye Magumba, Aziza Kakerewe and Olivia Kwagala Mawanda, all independents. The battle is mainly between Nantale and Asinde, with either camp deploying big wigs to campaign for them. On Monday, President Museveni was in the area and asked voters to vote Asinde. 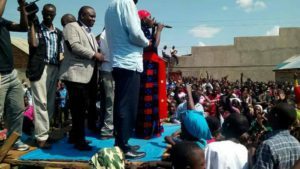 FDC’s Mariam Nantale rallies voters. MPs like Francis Mwijukye (FDC) said few legislators speak the truth in Parliament, adding that he was optimistic that Nantale, if voted, will be among the few. The opposition team combed the remote areas of Idudi, Ibulanku, Busembatya, Bugweri county before wrapping up with a mega rally in Iganga town. Out of 12 by-elections organized so far, FDC and other political parties have never won any by-election. Only independent leaning opposition candidates won Kyadondo East AND Aruu in Northern Uganda.